Description: As more public sector agencies desire to move to internet-based testing to administer their selection processes, there is increased concern that the loss of live proctors makes online processes unreliable, invalid, or just too risky. In fact, many experts believe that because we do not have live human proctors to perform the vital test administration functions of ensuring candidate identification, maintaining test security, and controlling cheating, unproctored internet testing is never appropriate for high stakes testing, which includes employment testing. Remote proctoring provides a mechanism to monitor online test takers in their own environment through the use of sophisticated identity verification, a webcam to observe the test taker from a remote location, or software that monitors the test taker’s computer to detect behaviors that indicate possible cheating. With technology filling the traditional role of live human proctors, is a remotely-proctored test now a truly viable option for employment testing? 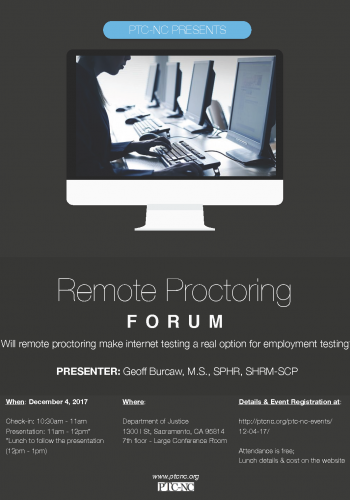 In this session, we will examine various options for remote proctoring and compare remote proctoring to other testing modalities, including unproctored internet testing and proctored computer-based testing, in terms of how well each allows us to ensure a standardized, secure, and valid testing process. We will end with a discussion of issues an agency should consider if deciding to implement remote proctoring. Attendance is free for this event.